Recordings of our sixth CD have begun. 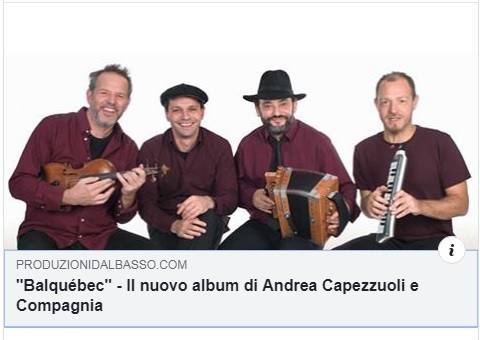 A double disc entirely dedicated to French-canadian dances, with a booklet containing explanations of the dances and the presence of three French musicians who are well known for their competence and passion for this music: Alain Chatry, Manu Savinelli and Corentin Boizot-Blaise. An exciting work for us but tiring and expensive. We ask you to support the production by helping us financially. At this link you will find the crowd funding page. To thank you we have thought of a series of prizes and gifts that you will surely enjoy. Andrea Capezzuoli e Compagnia t-shirts are available. Write us to order them!